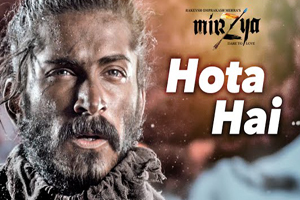 A pop song sung by Daler Mehndi, Sain Zahoor, Akhtar Chinnal and Nooran Sisters starring Harshvardhan Kapoor, Saiyami Kher. The audio of this song is available on YouTube at the official channel T-Series. This audio is of 5 minutes 06 seconds duration. Lyrics of "Ishq Mein Hota Hai (Tun Tuna)"
Lyrics in Hindi (Unicode) of "इश्क में होता हैं (तुन तुना)"